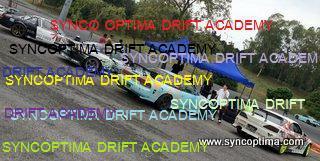 Once again, we had the opportunity to conduct another of our Drift 101 lesson for a bunch of enthusiastic Singaporeans. Held at the Nusajaya Drift track in Johore, this solid 8 hour intensive course saw our students drifting effortlessly by the end of the day. As much as we love to get all the credit for this, we have to mention that this particular bunch is by far the most talented that we have ever encountered !!! This entry was posted in Ariff, SODA and tagged drift, drift academy, Drifting, malaysia drift, singapore drift, SODA on September 26, 2009 by skagee. Held at the Goodyear Malaysia headquarters in Shah Alam, the Advance Tech Inspection had the vehicles of the Malaysian drift teams thoroughly examined for the up coming Formula Drift Singapore PRO/AM series coming this early July. Conducted by trained and certified Formula Drift inspectors, Ricky Lin and Benjamin Khoo , the vehicles were made sure to meet the stringent technical and safety requirements as specified by Formula DRIFT Holdings LLC. This was in line of Goodyear’s goal of elevating the standards of drifting in Malaysia to international levels through it support and collaboration in this event ! Tengku Djan was eager to get the his cars inspected that he came an hour early to be first in line! A number of the press were present that day and were given a brief overview of the event and which also highlighted the importance of the technical inspection that was being held that day. Fento D’s , Loyai showing off his new colors.. This entry was posted in Drifting, Formula Drift, Goodyear and tagged car inspection, Drifting, Formula Drift, formula drift singapore, Goodyear, malaysia drift, singapore drift on June 28, 2009 by skagee. Cheaka and I were invited down to Singapore once again for the Formula Drift Singapore media day held at the actual site at the Changi exhibition center. Both of us had recently had some work done on our car, so we found it to be the perfect opportunity to test them on this trip. We decided to bring Leong along this time , just in case something happen though. We arrived at midnight on that day and once again were put up a night that the lovely Hotel RE. This time courtesy of ESPN Singapore. They were informed that there will be three of us going down this time, and so the thoughtful people in ESPN gave us a suite!! We arrived at the exhibition center at 11 am and got around at setting up a simple course for the demo and taxi ride we were doing. We did interviews and demo/taxi rides for a number of different TV stations and Tv programs . Cheaka also did a basic drift lesson with the Channel News Asia’s host which was aired a few days later. After the event we had dinner with an old friend and former sponsor ,Patrick and wife Jacinda from Imperial concepts. Its been ages since we last saw him as he is constantly overseas but it refreshing to find out he is the same jovial person as before! We had a good night’s sleep before making our way back to KL the next day. This entry was posted in Formula Drift, Goodyear and tagged drift, Drifting, eagle revspec, Formula Drift, malaysia drift, singapore drift on June 28, 2009 by skagee. Early next morning, we were greeted by, a sleepy looking, Ivan Lim and his buddy ,Ben, They both led us to the Shaw Towers where the crew were busily in admist of set up. Cheaka finds the right spot to park her car..
Ben showing us his uber high tech multiple screened gaming console in his bedroom..He has tons of gaming memorabilia which includes a life sized Final Fantasy sword!! This dude will be getting a drift Supra shipped to Singapore pretty soon! Contestants for the Design the car decal competition..
A crowd started to gather.. Winners of the first competition that day.. When we got back to the hotel, I took a good look underneath the car and was shocked to find that the bolt the held the rear suspension strut to the axle had came off and was just hanging there!! We tried going around the shops to find a replacement bolt and bushing but were to no avail. Thankfully, the ever resourceful Ivan had tons of bolts and bushing at this house and was able to find one that fits. He even laid down on the road to help me fix it..For that I really owe him big time!!!.. thanks buddy!! I really want one of those!! The night ended with supper at the Newton Circus food court before the leaving the next day. This entry was posted in Formula Drift, Goodyear, Life Style and tagged ae86, car design, event, Goodyear, malaysia drift, shaw, singapore drift on June 28, 2009 by skagee.